Come hang with all the other cool sunshine people of California for a Groovin' Jazz Night with ANNA MJÖLL @ Herb Alpert's VIBRATO! This Friday, October 1st, at 9pm. Then you'll understand why we at Jazz Station have voted her one of the Top 5 singers in the current jazz scene. ALMOST SOLD OUT - AGAIN!!! 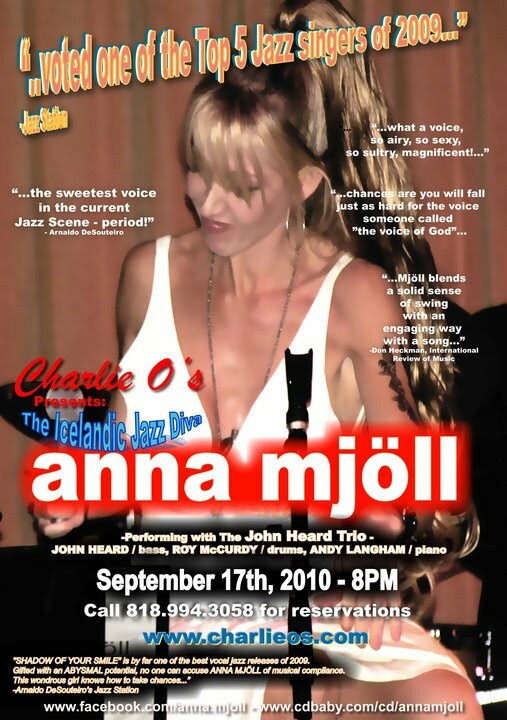 Anna Mjoll and the Pat Senatore Trio, led by the great bassist who is Vibrato's artistic director. NO COVER! But call 310.474.9400 for Reservations. 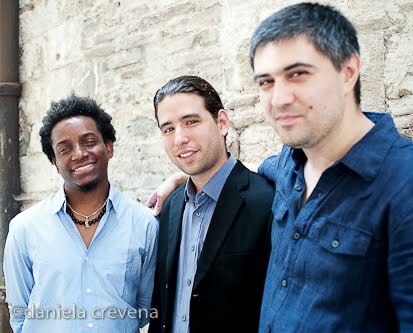 The Alfredo Rodriguez Trio, fresh off recent European and Asian tours will make their first appearance in Los Angeles (as a trio) this Thursday as part of Ruth Price's Jazz Bakery "Movable Feast." Alfredo just finished a tour that included stops at the Montreux Jazz Festival in Switzerland, The North Sea Jazz Festival in Holland, The Umbria Jazz Festival in Italy, the Warsaw Open Air Festival in Poland, The Duc De Lombards Festival in France, The Opening Ceremonies of the Shanghai Film Festival in China, The Mundo Latino Festival in Brazil, The Opening Ceremony of the Shanghai Tourism Festival in China, and many, many others. This will be the trio's first ever performance in Los Angeles, and Alfredo's first performance since his performance at the Rose Bowl with the Pasadena Symphony. Do not miss this rare chance to see Alfredo live in LA. Gina Saputo back @ Steamers, October 1st! One of our favorite vocalists in the contemporary jazz scene, Gina Saputo will be appearing @ Steamers this Friday night, October 1st. She will be backed by Matt Politano, Nick Schaadt and Evan Stone, with special guests Larry Salzman and Emily Michels. Gina usually writes the setlist by hand about an hour before the show, but it will probably include such songs as "I’ve never been in love before," "Cheek to cheek," "Call me," "Until I met you," "Fool on the hill," "They can’t take that away from me," "Bye bye blackbird," "Chega de saudade," "My man’s blues," "Exactly like you" and "'Round midnight." Gina Saputo is a vocalist, entertainer, clinician and arranger who has already established herself as one of the rising young stars on the scene. From there, Gina attended USC’s prestigious Thornton School of Music. 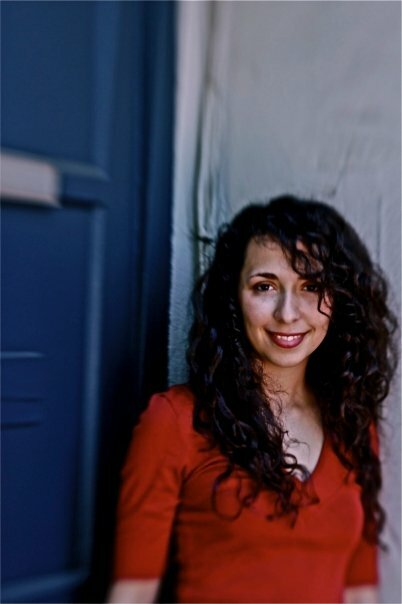 Gina was among seven musicians chosen by Herbie Hancock, Terence Blanchard, and Wayne Shorter to study at the Thelonius Monk Institute. 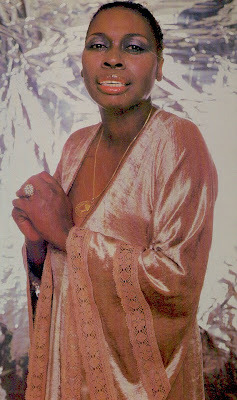 During her time with the institute, she performed for the State Department in Washington, D.C., and toured Vietnam with Hancock, Shorter and Nnenna Freelon. 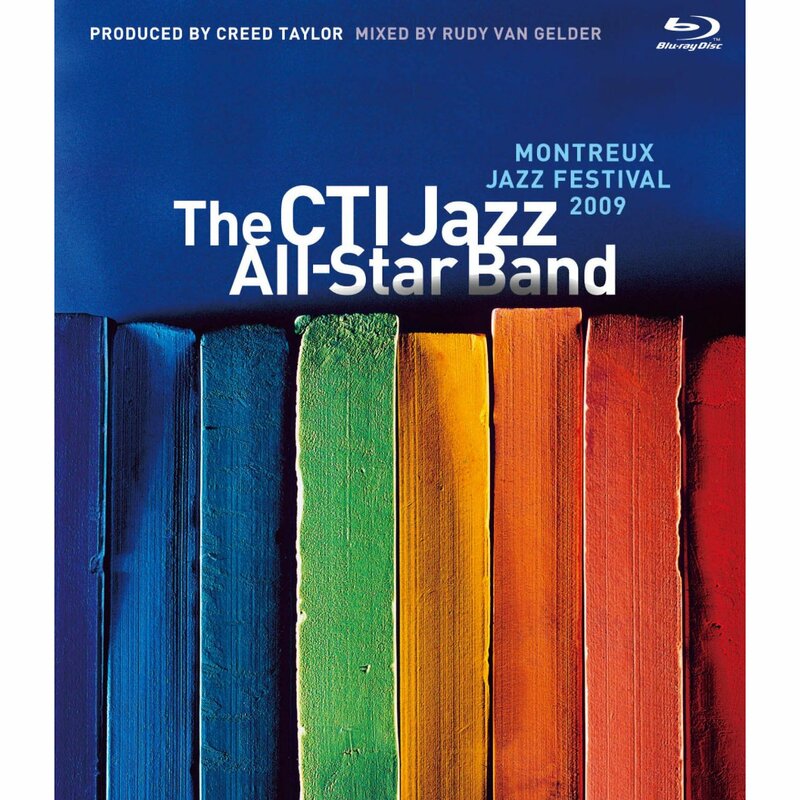 Her first CD, “Gina Saputo,” which featured pianist Gerald Clayton, was recorded with vocal sessions produced by Grammy award nominated vocalist Tierney Sutton, who said, “Gina has the talent as well as the passion to stretch and think outside the box.” After two successful tours of Japan, her CD has climbed to #3 on the prestigious Swing Journal charts, and has received rave reviews. She was a guest professor at Gwangju University in South Korea, and toured Japan a second time with Grammy nominated pianist Bill Cunliffe. 2009 was a great year for Gina. She appeared at the Skywards Dubai International Jazz Festival. She won First Place at the Big Stage Vocal Competition, and was the vocalist for the Orange County Music Awards winning band for Best Jazz in Orange County. She recently recorded two ringtones which will be default rings on upcoming Samsung phones, and headlined Club Nokia at LA Live! DJ Tatiana Fontes in NY, tomo nite! Fedde le Grand & Mr. V's "Back n Forth" perform live at Melodic tonite! This Week Mr. V takes center stage along w/ opening set by The EC Twins! He will be performing it live on the mic tonight!! Discounted entry before midnight by mentioning "Pete G's List" @ the door! Hit up Pete G for birthday bookings or table specials!! Don't let this band's name fool you: Toph-E & The Pussycats are a group of veteran jazz musicians whose combined resumes include television gigs, Grammy awards, and musician credits from James Brown to Miles Davis. 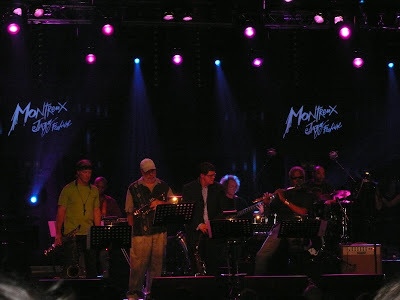 Led by drummer Chris Parker, the group also features bassist Will Lee, pianist Clifford Carter, saxophonist David Mann, and percussionist Ralph MacDonald. 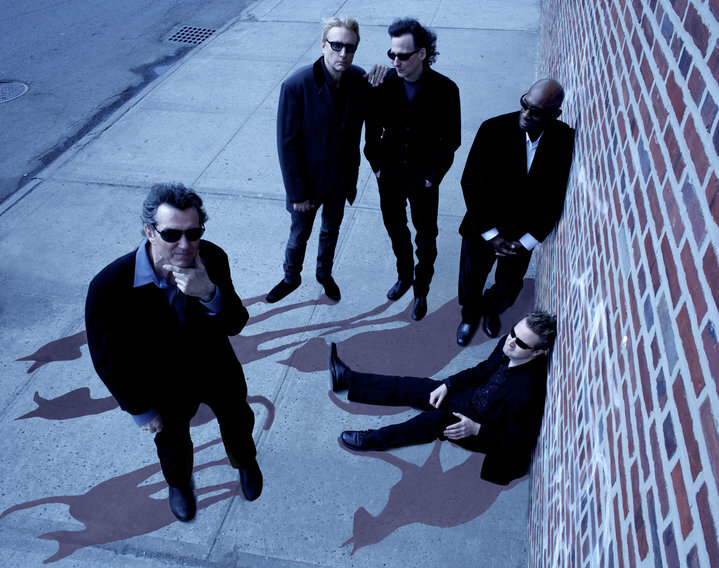 The New York-based group, which was formed in 2000, performs compositions with a heady mix of jazz, R&B and rock music, basing them around a musical philosophy dubbed "R&B-bop." Drummer Chris Parker, pictured above, has been a member of The Brecker Brothers, Stuff, Joe Cool, and NBC's Saturday Night Live. He has toured with Bob Dylan, Bette Midler, Joe Cocker, Paul Simon and the legendary Stuff band. He has recorded with Donald Fagen, Ashford and Simpson, Eumir Deodato, Aretha Franklin, Natalie Cole, James Brown, Salt ‘n' Pepa, Miles Davis and Cher. Will Lee, on bass and vocals, hails from The Late Show with David Letterman on CBS, and The Fab Faux. 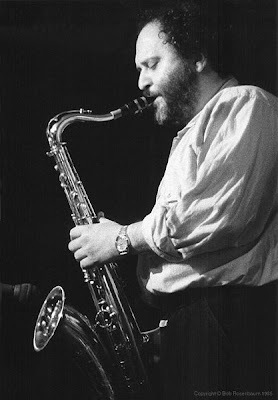 He has performed and appeared on numerous recordings with Frank Sinatra, Bette Midler, Barbara Streisand, Mick Jagger, Steely Dan, Esther Phillips, Joe Beck, Deodato, Don Sebesky, Bob James, Kimiko Itoh, The Brecker Brothers, Richard Tee, David Matthews, Patti Austin and James Brown, to name a few. Ralph MacDonald, percussionist and Grammy winning songwriter, started with Harry Belafonte when he was only 16 years old and went on to have Grammy winning hit records of his songs recorded by Bill Withers & Grover Washington Jr. ("Just the Two of Us"), Donny Hathaway and Roberta Flack ("Where is the Love?") plus Roberta's "No Tears In The End" and "When You Smile"), and Grover Washington, Tony Bennett and Esther Phillips, who covered "Mister Magic." He released several solo album and has performed on countless recordings with such artists as George Benson, Gabor Szabo, Bob James, Aretha Franklin, Luiz Bonfá, Esther Phillips, Hubert Laws, Ron Carter, Toots Thielemans, Blood Sweat & Tears, David "Fathead" Newman, Joe Farrell, Tom Scott, and Jimmy Buffett. Cliff Carter, on piano and keyboards, has been the pianist with Patti Scialfa, recorded and toured with James Taylor, Bryan Ferry, Idris Muhammad, David Matthews, Hank Crawford, Esther Phillips, Betty Buckley, Melissa Errico and Brethren Crazed Man and the Wildlife Ensemble. David Mann, tenor and soprano saxophones, has released solo albums, most recently, "Touch," on N-Coded Music, as well as producing many other artists, like Wayman Tisdale, Nelson Rangell and Rachel Z. His recording credits are extensive, including Tower of Power, James Taylor, Paul Simon, Queen Latifah, Madonna, Bob James and Sting. The cause was a respiratory ailment, his daughter Cheryl Collette-White told The Los Angeles Times. Although Mr. Collette never attained the fame of many jazz stars, he played beside them, from his days as a teenager in the 1930s until a stroke ended his career in 1998. 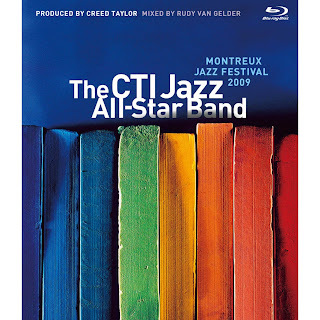 According to Ted Gioia's "History of Jazz" (Oxford University, 1997), one of Mr. Collette's closest colleagues, the bassist Charles Mingus, went so far "as to claim that his friend Buddy Collette could play as well as Bird" -- a reference to the nickname of the renowned saxophonist Charlie Parker. Besides Mr. Mingus and Mr. Parker, Mr. Collette performed with Duke Ellington, Count Basie, Thelonious Monk, Stan Kenton, Sarah Vaughan, Ella Fitzgerald, Frank Sinatra, Nat King Cole, Nelson Riddle and Louie Bellson. He came to national attention in 1955 as a member of the drummer Chico Hamilton's quintet. But he had already made his mark, moving from small jazz groups to big bands and from film studio work to television. In the estimation of The New Grove Dictionary of Jazz (Macmillan, 2002), Mr. Collette brought a "virile approach" to the saxophone. And, as a flutist, it said, "Collette's fluent playing helped shape a style of chamber jazz that utilized a soft instrumentation, but was nonetheless improvisational, swinging, and in its own way, hot." William Marcel Collette was born on Aug. 6, 1921, in the Watts district of Los Angeles. His father, Willie, was, a pianist; his mother, Goldie Marie, was a singer. In addition to his daughter Cheryl, Mr. Collette is survived by two other daughters, Veda and Crystal; a son, Zan; eight grandchildren; and nine great-grandchildren. As a child Mr. Collette went to a Louis Armstrong concert with his parents and soon turned from piano lessons to the saxophone -- and jazz. When he was 12, he formed his first band. Among the youngsters in the group was Mr. Mingus, whom Buddy convinced to switch from cello to bass. 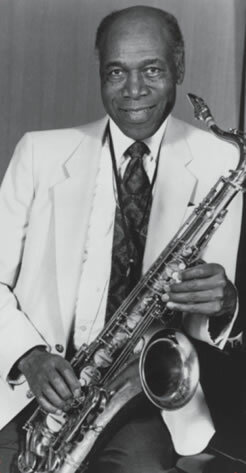 After serving in the Navy in World War II, during which he led a dance band, Mr. Collette became a well-known name among the swing and be-bop players in the night spots dotting Central Avenue in Los Angeles. In 1949, he broke a color barrier by being chosen as the only African-American in the band for the Groucho Marx show "You Bet Your Life." Along with the pianist Benny Carter and the arranger Marl Young, Mr. Collette became a leader in the struggle to eliminate segregation in the American Federation of Musicians. On April 1, 1953, the black and white locals of the union in Los Angeles merged. "I knew that was something that had to be done," Mr. Collette told The Los Angeles Times in 2000. "I had been in the service, where our band was integrated. My high school had been fully integrated. I really didn't know anything about racism, but I knew it wasn't right. Musicians should be judged on how they play, not the color of their skin." When it comes to unsung jazz heroes, Buddy Collette's talents on tenor saxophone, flute, and clarinet are as close to unmatched as it gets. A gifted composer of classical music in addition to his jazz pedigree, Collette continues to fly almost defiantly under the radar of greater renown. William Marcel Collette was born on August 6, 1921 in the Watts district of Los Angeles. Along with saxophonist Dexter Gordon bassist Charles Mingus, and drummer Chico Hamilton, he helped keep bebop alive in the city's historic Central Avenue neighborhood. 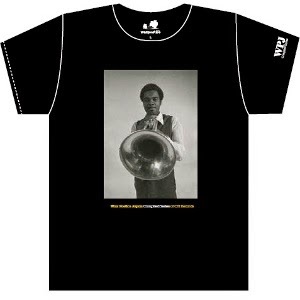 Buddy also played an important role with the development of the cool jazz movement. After attending a concert by the legendary trumpeter Louis Armstrong with his parents, a young Collette was taken by the idea of a career in jazz. 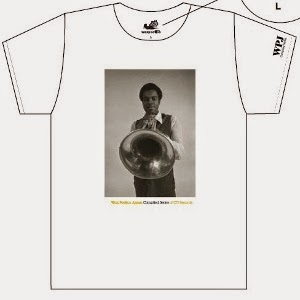 Satchmo's achievements and lifestyle presented an appealing alternative to the menial and often degrading jobs open to African Americans during the Depression. In 1933, at the age of 12, Collette formed his first jazz ensemble. The group contained, of all people, a talented teenager named Charles Mingus, who Buddy convinced to switch from cello to bass. Mingus was already an extraordinary talent, but his infamous temper was also firmly in place. In the years that followed, Collette was instrumental in helping Mingus forge better relationships with various musicians and producers. Buddy's gentle, friendly demeanor was the perfect counterpoint to the ornery bassist; they became lifelong friends. Remembering the action on and off Central Avenue, Collette speaks fondly of the lengthy jam sessions from that district during the 1930s and '40s. During those years the area around Central Avenue was filled with the sounds of swing, and, after World War II, bebop. Collette enlisted in the military during World War II. When he returned to Los Angles, he quickly became one of the city's first bebop players. In 1949, Collette recorded "It's April" in the backroom studios of Dolphin's of Hollywood. Although "It's April" and other tunes recorded at Dolpin's were receiving radio airplay and selling well, studio owner John Dolphin seldom paid the musicians. This money conflict eventually led to the stabbing and killing of Dolphin by one of his musicians. Buddy left Dolphin behind and overcame tough racial barriers in the industry by becoming the first African American to perform in a television studio band, appearing on Groucho Marx's television show, You Bet Your Life. Fortunately, Collette was not content on being the only black musician in the television studio orchestra. He eventually became a political and cultural activist in the battle against segregation in the music industry, and the burgeoning influence of McCarthyism. He also helped organize a concert and rally protesting government repression of the legendary African American singer, actor, and political activist Paul Robeson. Collette's artistic and social activism continued when he led a grassroots campaign to desegregate the Los Angeles musician's union. Gerald Wilson, Frank Sinatra, Nat "King" Cole, and saxophonist Benny Carter were some of Collette's early supporters. None of these activities got in the way of Collette's music making. In 1955, he became a founding member of drummer Chico Hamilton's legendary quintet. 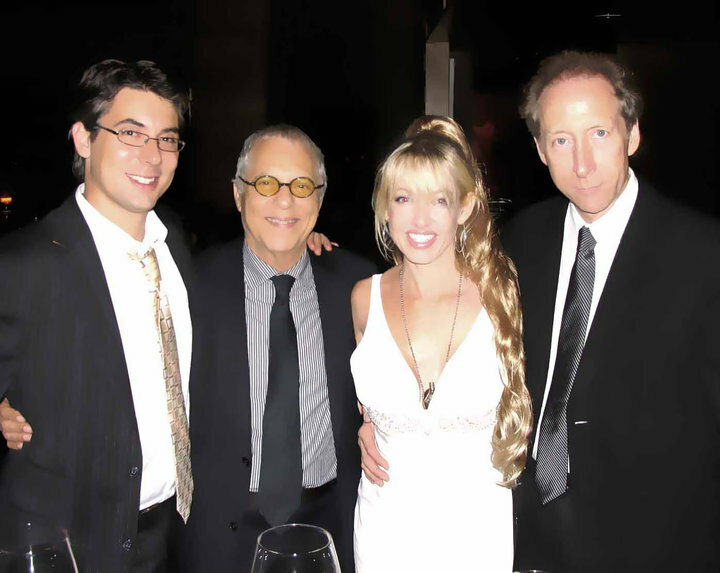 The unusual quintet also featured pianist and cellist Fred Katz, whom Collette calls "the first jazz cello player." A year later, Collette recorded Man of Many Parts, his first album as a bandleader. The album not only demonstrated Collette's mastery on saxophone but also his compositional talents. In the late 1950s, the careers of Collette and his West Coast contemporaries were taking off. But while most of them like Mingus, Hamilton and saxophonists Eric Dolphy and Charles Lloyd moved to New York for more lucrative gigs, Collette stayed in Los Angeles. Although Collette didn't become a household name like his friends, he did become a noteworthy educator in the 1960s. His students included such wonderful woodwind players as James Newton, Frank Morgan, Sonny Criss, Eric Dolphy, and Charles Lloyd. In 1996, the Library of Congress commissioned Collette to write and perform a special big band concert to highlight his long career. For the concert Buddy brought together some of his old musical mates from Los Angeles including Jackie Kelson, Britt Woodman, and Chico Hamilton. Today, Collette is receiving more recognition than ever. Although he no longer performs due to a stroke in 1998, the gleaming beauty, immense talent, and gentle spirit of Collette remain intact and highly influential. 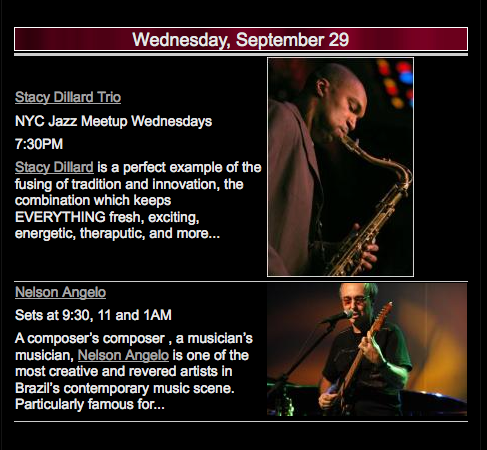 Brazilian genius Nelson Angelo does an ultra-rare NY apperance @ Zinc Bar (82 West 3rd St) this next Wednesday, September 29. Don't miss this event! CD of the Week - "Pat Metheny & Anna Maria Jopek: Upojenie"
Featuring: Anna Maria Jopel (vocals & Fender Rhodes), Pat Metheny (acoustic, electric, baritone & soprano guitars, guitar synthesizer, 42-string Pikasso guitar, keyboards), Leszek Mozdzer (piano), Pawel Bzim Zarecki (keyboards, programming & loops), Darek Oleszkiewicz (acoustic bass), Marcin Popsieszalski (electric bass, loops & programming), Cezary Konrad (drums), Mino Cinelu (percussion), Henryk Miskiewicz (soprano sax), Bernard Maseli (vibes) et al. As Eddie Fisher once put it, by the time he was 33, "I had been married to America's sweetheart and America's femme fatale, and both marriages had ended in scandal. "I'd been one of the most popular singers in America and had given up my career for love. I had fathered two children and adopted two children and rarely saw any of them. I was addicted to methamphetamines and I couldn't sleep at night without a huge dose of Librium." And looking back over a tumultuous life that included his years with Debbie Reynolds and Elizabeth Taylor, he wrote in his 1999 memoir, "Been There, Done That," that he had learned one important lesson: "There were no rules for me. I could get away with anything so long as that sound came out of my throat." Fisher, who died Wednesday at 82 at his home in Berkeley from complications of hip surgery, traveled one of the rockier roads in show business, one marked by well-documented personal and professional peaks and valleys. But there was no denying the impact of "that sound" that came out of the darkly handsome young Philadelphia native's throat during his 1950s heyday. "He had the biggest voice I ever heard," singer Andy Williams told The Times on Friday. "I used to do numbers with him and Bobby Darin on my show. He used to blast the hell out of us. His voice was so big, round and full." Beginning with his first hit, "Thinking of You," in 1950, Fisher became one of America's most popular recording artists, a singer whose looks and voice made bobby-soxers swoon and spurred the creation of fan club chapters around the world. During much of the '50s, Fisher had a long string of Top 10 -- and No. 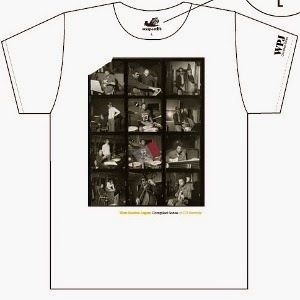 1 -- hits, including "Any Time," "Tell Me Why," "I'm Walking Behind You," "I Need You Now" and "Oh! My Pa-Pa."
He also headlined nightclubs, made TV guest appearances and starred in his own popular 15-minute TV music show, "Coke Time With Eddie Fisher," from 1953 to '57. That was followed by "The Eddie Fisher Show," an hour-long music-variety program that aired from 1957 to '59. But in the end, Fisher told the Miami Herald in 1999, "it isn't the music that people remember most about me. It's the women." His 1955 marriage to Reynolds, Hollywood's girl next door, was greeted with headlines such as "America's Sweethearts Tie Knot." The marriage produced two children, Carrie and Todd. But Fisher outraged fans when he left Reynolds for Taylor after Taylor's husband and Fisher's best friend, film producer Michael Todd, was killed in a plane crash in 1958. Fisher and Taylor were married the next year. But then Taylor fell in love with Richard Burton during the filming of "Cleopatra," which generated another round of international headlines and caused Fisher to check into a New York City hospital with a reported nervous breakdown in 1962 after returning from Rome, where his wife was making the movie. The Fisher-Taylor divorce became final in 1964. "This was an era when the movie magazines were going full force, and the coverage" of Fisher's romantic entanglements "saturated popular culture to the max, for years on end," recalled film reviewer Kevin Thomas, a former Times staff writer. Fisher, Thomas said, "was the real loser in all of this. He got heaps of scorn for deserting Debbie. In the magazines, she was the sweet girl next door who had been cast aside for the legendary temptress." Fisher's 1967 marriage to actress and singer Connie Stevens, with whom he had two daughters, Joely and Trisha Leigh, ended in divorce in 1969. He was married to Terry Richard, a former beauty queen, from 1975 to '76. Fisher's fifth wife, Betty Lin, a Chinese-born businesswoman whom he married in 1993, died in 2001. Although Fisher co-starred with Reynolds in the 1956 comedy "Bundle of Joy" and co-starred with Taylor in "BUtterfield 8," the 1960 drama for which Taylor won an Oscar, he never developed his own film career. With the impact of rock 'n' roll, Fisher's record sales began to decline in the late '50s. "It is very hard to overestimate his popularity in the 1950s," Thomas said. "He was on TV all the time. He really was big, and then the whole rock 'n' roll revolution came along. His music was going out of style, and he would have had a tough time anyway, and then there was all this coverage of his personal business." 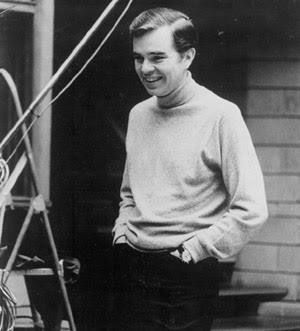 Fisher was "underestimated for his natural talent and beautiful voice," said Michael Feinstein, a singer known for interpreting American standards. "He was saddled with substandard material that he was forced to record by his record company," Feinstein told The Times. "Had he been given the opportunity to sing more enduring music, to record more enduring standards, as did Frank Sinatra, perhaps he would be better acknowledged today." "He was blessed with an extraordinarily beautiful, rich and resonant tenor voice that was quite thrilling," Feinstein said. "He also had a fundamental problem with rhythm, and that sometimes got in the way of his ability to interpret a song." In a 1991 interview with the Chicago Tribune, Fisher said of rock 'n' roll: "I did not think that would have any effect on me. I thought I was above and beyond all that. I thought I had created this niche and nothing could take it away." The son of Russian-born Jewish immigrants and one of seven children, Fisher was born in Philadelphia on Aug. 10, 1928. Encouraged by his grandmother to sing Jewish folk songs when he was 2 or 3, Fisher was singing duets in Hebrew with the cantor at their synagogue by the time he was 7 or 8. By the time he was 15, he was a local radio star singing six days a week on three different shows. His picture appeared in advertisements on the fronts of trolley cars and, he later wrote, "the newspapers reported that by the time the trolley reached the end of the line, my picture was covered with lipstick." Fisher, who dropped out of high school in his senior year, sang with the bands of Buddy Morrow and Charlie Ventura when he was 18. He began achieving national recognition on entertainer Eddie Cantor's radio show in 1949. Fisher's burgeoning career was interrupted by Army service from 1951 to '53 while he was assigned to the Army Band entertaining troops in Asia and Europe. Even then, he was deluged with fan mail. Fisher attempted numerous comebacks over the years. "It went something like this, to the sound of snickering: 'Bad luck is better than no luck at all.' 'I work alone -- finally.'... 'I don't sing professionally anymore. It's a sideline. I'm really a marriage counselor.'" Everybody, Murphy wrote, "was in on the put-down. They all knew Eddie's secrets and elbowed each other to prove it." Fisher expanded on his "secrets" in "Been Here, Done That" and his 1981 book "Eddie: My Life, My Loves," in which he claimed to have stopped abusing drugs. He later recanted. "I wrote that book under the influence," he told the Chicago Tribune in 1991. "Cocaine. That's what happens with drugs. You lie. You lie a lot." He credited future wife Lin with persuading him to seek help, which he received at the Betty Ford Clinic. At the time of the interview, he had been clean for 18 months. "That's the longest I've been sober since I got out of the Army in 1953," he said. "Really, I'm lucky to be alive and lucky to have a fresh outlook on life." In a statement from the Fisher family announcing his death, the family said that "the world lost a true American icon. "He was loved and will be missed by his four children: Carrie, Todd, Joely and Tricia Leigh as well as his six grandchildren. He was an extraordinary talent and a true mensch." Times staff writers Valerie J. Nelson and Elaine Woo contributed to this report. Before Fabian, Bobby Rydell, and Frankie Avalon -- and "American Bandstand" -- turned this city into the teen-idol capital of the world, another bushy-haired, baby-faced singer from Philadelphia made 1950s teenyboppers swoon: Eddie Fisher. Fisher, 82, who died in Berkeley, Calif., on Wednesday of complications from surgery after breaking a hip this month, was a South Philly grocer's son whose voice carried him to a stardom that his tumultuous personal life would eclipse. More than his musical triumphs, Fisher these days is better known for his string of movie-star marriages -- to Debbie Reynolds, Elizabeth Taylor, and Connie Stevens -- and for being the father of the actress and writer Carrie Fisher. But in the pre-rock early 1950s, Fisher was a constant hitmaker. Fisher, known as "Sonny" to his family, began his musical career as a child, singing on WFIL-AM and skipping school to practice his music. He attended Simon Gratz and South Philadelphia High Schools, but did not graduate. After comedian Eddie Cantor discovered him at the Grossinger's resort in the Catskills and legendary Philadelphia record executive Manie Sacks took him to RCA Victor, Fisher racked up a string of successes. A crooner with a sweet, soaring tenor, he scored 17 Top 10 hits between 1950 and 1956, including "Tell Me Why," "Any Time," and "Oh! My Pa-Pa."
By the time he was 24, RCA had sold more than seven million Fisher records and Fisher had become an international star. 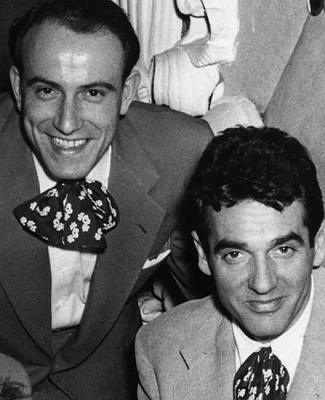 "He was a real ballad singer, in the same genre as Vic Damone and Tony Bennett," recalled Ed Hurst, who along with his partner, Joe Grady, hosted the top-rated "The 950 Club" on WPEN-AM from 1949 to 1956. Fisher was a frequent guest. "The Eddie Fisher Show," also on NBC, from 1957 to 1959. "He had just as much fame as Fabian, Bobby Rydell, all those guys, but he came before them. He had a pretty voice, and he made some nice records," Hurst said Friday. "The teenagers, the bobby-soxers loved him. He was their cup of tea. Everybody wanted to mother him. He always had that boyish grin, and the hair. He was cute." Cute enough to win the hearts -- for a time, anyway -- of glamorous women. Fisher was wed five times. "He married all those lovely ladies," Hurst said. "Liz Taylor, Debbie Reynolds, Connie Stevens. I thought it was pretty good for a South Philly boy." Fisher married his first wife, Reynolds, in 1955, and they had two children, one of them Carrie. But he fell in love with Taylor, the wife of his friend Mike Todd, the movie producer, after Todd died in a 1958 plane crash. The following year, he divorced Reynolds and married Taylor, who would dump him five years later in favor of Richard Burton. After that, he married Stevens, with whom he had two daughters. Fisher later married beauty queen Terry Richard, followed by businesswoman Betty Lin. Fame came "extraordinarily fast" to Fisher, recalled Peggy King, a singer who was Reynolds' best friend when both were MGM contract singers in the early 1950s. "Pretty Perky Peggy King" sang on George Gobel's show, which was filmed across the hall from Fisher's show. "I don't think that Eddie ever accepted what happened to him," said King, who moved to Philadelphia in 1962 after stepping aside from show business to raise a family. "He wanted to be in the business, but didn't want it to take up too much of his time." Fisher was complicated. He was "easy to get along with," she said Friday, but "I was wildly annoyed with his behavior toward Debbie." "I believe Eddie wanted to be loved, which explains the [five] wives," said King. "I got lucky" in her own marriage. Fisher did little to make anyone love him with his two memoirs, "Eddie: My Life, My Loves" (1983) and "Been There, Done That" (1999). He proved to be a memoirist with no gallantry who blamed his problems on others. "By the time I was thirty-three years old, I'd been married to America's sweetheart and America's femme fatale and both marriages had ended in scandal," he wrote in "Been There." "...I was addicted to methamphetamines and I couldn't sleep at night without a huge dose of Librium. And from all this I had learned one very important lesson: There were no rules for me. I could get away with anything so long as that sound came out of my throat." What came out of that throat was no real help to him when he tried to turn himself into a movie star. His musical talent did not translate well to the screen. He appeared with his wife du jour in two films and they overshadowed him both times -- Reynolds in "Bundle of Joy" (1956) and Taylor in "Butterfield 8" (1960). For all his history of domestic discord, others remembered him fondly. Atlantic City radio host and writer Seymore "Pinky" Kravitz, 83, recalled Fisher, who appeared at the Steel Pier and in local nightspots, as "very friendly, with a smile on his face that people loved. It didn't change over the years, although he became bigger.... He was a very likable person. He never had a sneer." To Paula Kartman, 80, Fisher was a teenage pal back in South Philly when she was Paula Fromowitz. "He was great," she recalled. "He had a beautiful smile." Kartman met Fisher through his sister, Janet. She, Janet, Eddie, and Joey Forman, the late South Philly comedian, spent a lot of time together. Later, Kartman would have a few dates with Fisher. "He was a skinny kid, a good-looking kid," she recalled, but there was nothing romantic, just friends going out. Fisher already had a singing career under way. He sang on the radio and, Kartman remembered, at an assembly at Thomas Junior High School. "He was just a nice Jewish boy with a great voice," she said. CD of the Week: "E.J. Antonio - Rituals in the Marrow: Recipe for a Jam Session"
"She (Antonio) steps into this milieu with a confidence that is astonishing. Her art exemplifies a mature, highly-developed approach to an art that is as risky as it is rewarding when done well. What makes Antonio stand out is her ability to bring her voice as close to complex song as possible while retaining the speech-like aura of the poems. This is no small feat. Very few can pull it off. And while most practitioners of this art are conventional in their musical tastes, Antonio favors wide-ranging musicians who know both traditional and "free jazz" approaches. It's a choice that raises the stakes for the artists involved, just as it enhances the pleasures of listening to this collaboration," poet/author/teacher Geoffrey Jacques wrote in the liner notes. Poet E.J. Antonio, a 2009 fellow in Poetry from the New York Foundation for the Arts and a recipient of fellowships from the Hurston/Wright Foundation and the Cave Canem Foundation, envisioned her astounding debut CD, "Rituals in the marrow: Recipe for a jam session," as an "in-the-moment jam session." This one-of-a-kind recording is a unique blend of spoken words that dance with the sonic diversity of instruments as they wind their way through the genres of jazz, blues, gospel, r&b, and Afro-Latin rhythms. "I often go to live jazz performances," spoke Antonio, "and write down the images that come to me from listening to the music and watching the musicians' physical reactions to the music. These genres of music and this gift of words have influenced me my entire life. My bones have absorbed these sounds, move to these sounds, and rest in these sounds." 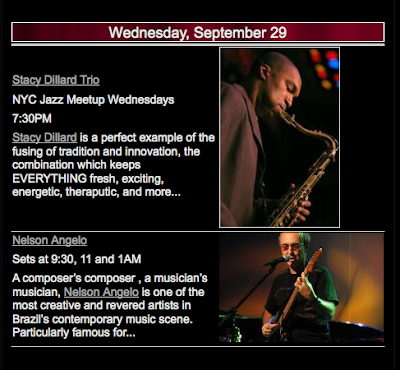 Blues, jazz, r&b and pop music were staples of Antonio's life growing up in Spanish Harlem. So was her fascination for words and gospel influences that were a direct result of watching her grandmother Lucille, a Pastor of Gospel Temple Church of Christ, work on and preach her sermons. The musicians on this project were chosen because of their creative improvisational skills and extraordinary ability to "listen" to each other. Antonio's concept was to keep an element of surprise and risk, so all the tracks, recorded at (Tony) Bennett Studios, in New Jersey, are live collaborations with no rehearsals. 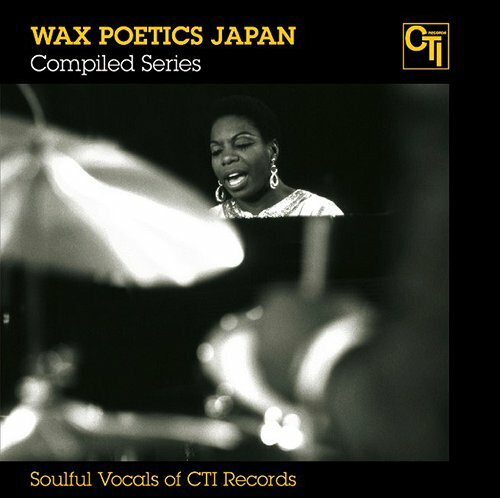 On the first track, renowned jazz artist Christian McBride along with Christopher Dean Sullivan (acoustic bass), Saco Yasuma (bamboo sax), and Joe Giardullo (reeds) resonate together to form the tension egg of sound necessary to make the birthing of the poem "foreign monkey" possible. Trumpet player Eddie Allen becomes the foil in "bluesman/truth be told," while Tyehimba Jess on harmonica is the "in-your-face" gospel sound bolstering the voice in "Pullman porter." "Sound rhythium" musician Michael T.A. Thompson (drums) and Joe Giardullo (flute) are complimented by Sullivan who uses his acoustic bass as a percussion instrument bringing home the Afro-Latin sound in the danceable "ballad mambo." Track number eight was inspired by the music of June Kuramoto and the sounds of the koto instrument. The bamboo sax of Saco Yasuma with the French horn treatment by Mark Taylor add the perfect touch of serenity and introspective to "koto suite." Every track, with words that drip like honey from Antonio's mouth, is clearly live improvisation at its best. "I use my work to bring attention to the commonalities we share as human beings, and to shed a light on the idea that there needs to be a place for a different kind of spoken word; that the collaboration of music and poetry is still a viable art form. Some call this jazzoetry, others call it pojazz, and others call it poemusic or spoken word. Whatever the title, it is clearly not just jazz or poetry, but something that resonates in the heart, something that causes a person to slow down and listen." "Rituals in the marrow: Recipe for a jam session"
As a child growing up in Harlem, NY, poet E.J. Antonio's love for words encouraged her ambitions to be a storyteller and a jazz singer. Her maternal grandmother, Lucille Markum, was the Pastor of Gospel Temple Church of Christ, a small Harlem church off of 130th street and Lenox Avenue that remains there today. She believes her fascination for words and gospel influences were a result of watching her grandmother work on her sermons late into the night and listening to her preach those sermons. The music that surrounded her as a youth was a result of growing up in Spanish Harlem where she could hear afro-Latin and afro-Cuban music coming from La Marqueta on 116th street and Park Avenue, the neighborhood bodegas, and the record stores. "Blues, jazz, r&b and pop music were staples played in my home and in Central Harlem where my grandmother lived," commented Antonio. "Chores were done listening to Lou Rawls, Aretha Franklin, Nancy Wilson, Smokey Robinson and the Miracles, the Temptations, the Shirelles, Patti LaBelle and the Blue Bells, Gladys Knight and the Pips, and many others." E.J. was known in her family as the writer, the visual artist, and the one interested in attending dance and theater productions. Although she only started writing poetry 12 years ago to help relieve stress, this Mount Vernon, NY resident has embraced all aspects of it with fervor. She has participated in several poetry workshops over the last ten years and studied with many well respected poets: Deborah Landau, Matthew Rohrer, Stephen Dobyns, Cheryl Clarke; Erica Hunt, Patricia Spears Jones, Patricia Smith, Cheryl Boyce Taylor, Louis Reyes Rivera, Thomas Sayers Ellis, Quincy Troupe, Carl Phillips, Ed Roberson, Cornelius Eady, Claudia Rankine, Toi Derricotte, A. Van Jordan, Tyehimba Jess, and Colleen McElroy. Antonio attributes her inspiration from poets Lucille Clifton and Sekou Sundiata along with jazz music idols Nancy Wilson, Sarah Vaughn and Billie Holiday. "I gravitate toward the work of Lucille Clifton and Sekou Sundiata because it is accessible. I can read it (or in Sekou's case, listen to it) and not feel like the poet was trying to leave the reader out. Billie Holiday and Sarah Vaughn's voices have always held my attention but after hearing a recording of Nancy Wilson, that I used to listen to as a child, I realized that some of the phrasing I use when reading my poetry I got from all those years of listening to her sing. " A 2009 fellow in Poetry from the New York Foundation for the Arts and a recipient of fellowships from the Hurston/Wright Foundation and the Cave Canem Foundation, Antonio continues to write, perform and record her original works. She has appeared as a featured reader at several venues in the NY tri-state area, such as Cornelia Street Café, the Bronx Council on the Arts First Wednesday reading series, the Calypso Muse Reading Series, the Hudson Valley Writers Center, the Harvard Club, WBAI's broadcast Perspectives, the National Jazz Museum in Harlem, the Bahai Center, Hunter Mountain Arts Festival, the Bowery Poetry Club, the Port Chester Art Fest 2008, 2009 and 2010, the Home Base Project, the York Arts Center, the Latimer House Museum, and the Howl Festival. Her work appears online at www.thedrunkenboat.com, poetz.com, and roguescholars.com, and has been published in various Journals and magazines; including, African Voices Literary Magazine, Amistad Literary Journal, Terra Incognita, Black Renaissance/Renaissance Noire, Mobius: The Poetry Magazine, The Mom Egg Literary Journal, One Word/Many Voices: A Bi-Lingual Poetry Anthology, and Torch. Her work is forthcoming in The Encyclopedia Project. The Premier Poets Chapbook Series published her first chapbook, Every Child Knows, in the Fall of 2007, and she is one of the featured poets on the CD, Beauty Keeps Laying It's Sharp Knife Against Me: Brant Lyon and Friends. E.J. is also a founding committee member and a volunteer poet for the Poetry Caravan, which brings readings and workshops to Westchester County nursing homes, shelters and rehabilitation facilities. She was a panelist for the 2007 Association of Writers' Programs Conference, where she discussed her work with the Poetry Caravan. 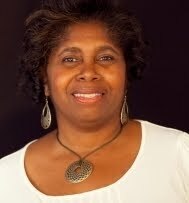 She has lectured at the Jazz Museum in Harlem on the collaboration of Jazz and poetry. "I use my work to bring attention to the commonalities we share as human beings, and to shed a light on the idea that there needs to be a place for a different kind of spoken word; that the collaboration of music and poetry is still a viable art form. Some call this jazzoetry, others call it pojazz, and others call it poemusic or spoken word. Whatever the title, it is clearly not just jazz or poetry, but something that resonates in the heart, something that causes a person to slow down and listen." 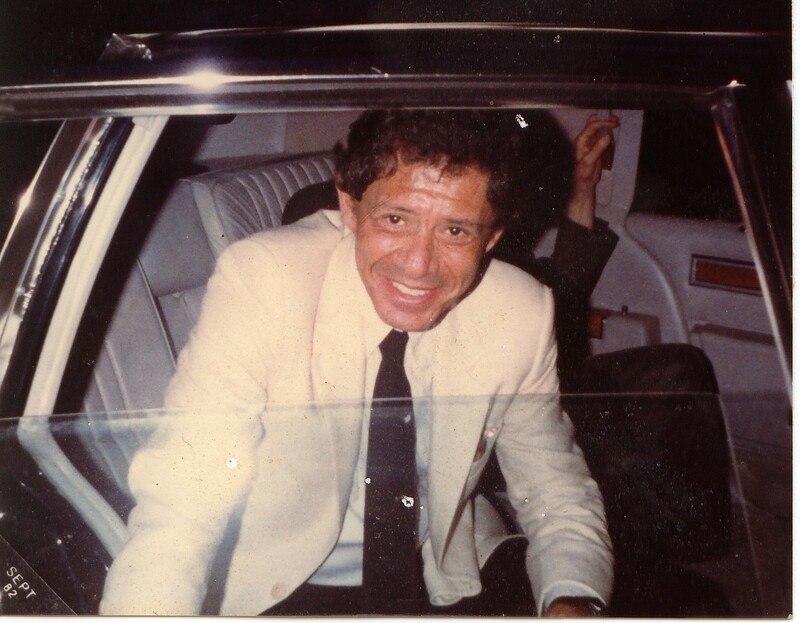 Singer Charles "Buddy" Hughes had a velvety voice that earned him praise from the Chairman of the Board himself, Frank Sinatra. Music buffs say Mr. Hughes might have become a big star, but he just missed the heyday of the Big Band era, and soon the record sales of crooners were being drop-kicked by a single-sobriquet singer named Elvis. But Mr. Hughes kept performing until he was 86. His talent won him appearances with legendary bandleader Jimmy Dorsey -- who ordered him to get a good suit. He performed with Gene Krupa, whose videos of his manic drumming keep earning him new fans raised on rock. However, Mr. Hughes was rejected for a gig by the notoriously stingy Benny Goodman, reportedly because he wasn't a twofer -- he couldn't play an instrument in addition to sing. Mr. Hughes, 91, who had cancer, died last month at his Glen Ellyn home. He was born in Waterloo, Iowa, and was in the Army in World War II in Algiers, Africa, where he sang with Martha Raye's pianist, Eddie Bigham. After the war, he traveled to New York and auditioned for Dorsey, who was having cocktails with Chicago Mayor Ed Kelly at the time. "Buddy had one suit. The suit didn't fit too well, and the sleeves were short," said Big Band historian Bob Knack. "But he went to the hotel, he sang a couple of songs for Jimmy Dorsey, and Jimmy Dorsey said, 'Here's the songs you're going to sing with us tomorrow night.'" The impeccable Dorsey added: "'Get a suit with long sleeves.'" Sinatra himself complimented Mr. Hughes after a New York City performance, said Mr. Hughes' daughter Patrice Hughes. "Frank came through before he left and put his hand on his knee and said, 'Nice singin,' kid,'" she said. Mr. Hughes saved the day when Chicago's Bert Rose Orchestra was backing Ray Bolger, who, in addition to being the Scarecrow in "The Wizard of Oz," had a hit song, "Once in Love with Amy." The orchestra blanked out. "Buddy was the one that saved us," Rose said. "He was able to hum the song and play a few bars, and it got us through the thing." His single "Sonata" was on the flip side of a million-seller by torch singer Fran Warren, "A Sunday Kind of Love," Knack said. "Buddy was on the B-side that nobody ever heard. We used to kid him, 'Buddy, you had a record that sold a million copies -- plus one.'" He had a voice "like liquid mercury," said his daughter Charlene Hopeman. Singer Mark Madsen added: "He was a feet-together crooner, the fingertips caressing the mike, like he was holding a woman. He was a romantic." As expert as he was as a singer, he was an even better father, said Hopeman. "He worked three jobs to provide for us," she said. With his Depression upbringing, he could fix a vacuum or rewire a lamp. "He would bring home busted-up old bicycles and tricycles and put them together so we could have one bicycle.... We thought that was the coolest thing in the world," Hopeman said. He read his kids Sherlock Holmes, and "on Saturday mornings, they'd all pile in his bed and play 'Name That Tune.'" His career might have been bigger if he'd broken into showbiz before the Big Bands waned. "If Buddy had started his career five years earlier, then Buddy Hughes would have been a household name like Perry Como or Sinatra," said Knack. He paid the bills with jobs ranging from railroad grain sampler, to copyist for a jingle writer, to TV repair. But he never stopped performing. After Goodman rejected him for not playing an instrument (he gave the job to singer-pianist Buddy Greco instead, according to Knack), Mr. Hughes taught himself to play the string bass. Even in his 80s, he played and sang at restaurants, Pheasant Run, and Glen Ellyn Jazz Fest. His lifelong ability to do what he loved could probably be summarized by a tune he sang at the Hollywood Palladium with Krupa: "My Number One Dream Came True." Mr. Hughes is also survived by his wife of 68 years, Minerva; daughters Pamela Jacob and Marsha Pertell; son John; four grandchildren and eight great-grandchildren. A memorial will be held from 10 a.m. to 1 p.m. Sept. 25 at Wheaton Wesleyan Church in Wheaton. Once described in a 1946 issue of Downbeat magazine -- the bible of jazz aficionados -- as "the freshest voice to be heard with a band," Charles Evans "Buddy" Hughes found a new voice as the demand for male vocalists began to wane. "He realized that if he wanted to stay with jazz, he needed to become more multifaceted as a performer," said his daughter Charlene Hopeman. That's when Mr. Hughes -- then a promising New York jazz vocalist with legendary big bands led by the likes of Jimmy Dorsey, Gene Krupa and most notably Claude Thornhill -- picked up the bass fiddle and seamlessly added it to his repertoire. "From the start it was like singing through his strings," Hopeman said. "It just felt right." In the early 1950s, Mr. Hughes moved to the Chicago area, eventually settling in Glen Ellyn, and began performing with such local musical icons as Joe Vito, Johnny Frigo and Bert Rose. He also worked as a copyist for composer and well-known Chicago jingle writer Bill Walker -- handwriting the music that Walker composed. After his big band days ended, Mr. Hughes continued to sing and play well into his 80s, until his battle with osteoporosis made performing too painful. "He'd have kept on playing if his back hadn't gotten so bad," Hopeman said. Mr. Hughes, 91, who was also a World War II veteran, died Monday, Aug. 23, in his Glen Ellyn home of cancer. Born in Waterloo, Iowa, Mr. Hughes began singing professionally at age 16 in musical shows in the Cedar Rapids area. From 1938 to 1942, he sang with the Minnesota-based Bennett Greten Orchestra. "He was such a natural," said another daughter, Patrice Hughes. "He could really carry a tune and had a great sense of rhythm." During World War II, Mr. Hughes served in the Army with the 102nd Cavalry in Algiers, where he sang in a weekly music show at a radio station 20 miles from his military base. "It took a while to get there, but it was worth every minute once he started singing," Hughes said. For several years, Mr. Hughes was also the owner and operator of a small television sales and repair shop in Glen Ellyn. "The shop helped pay the bills, but next to my mother, jazz was his one true love," Hughes said. Other survivors include his wife of 68 years, Minerva; a son, John; two daughters, Pamela Jacob and Marsha Pertell; four grandchildren; and eight great-grandchildren. A memorial service will be held from 10 a.m. until 1 p.m. Sept. 25 at Wheaton Wesleyan Church, 1300 S. President St., Wheaton. After another successful gig (two sold-out sets) at Herb Alpert's Vibrato on August 28th, with Josh Nelson, Pat Senatore and Bob Leatherbarrow, Anna Mjöll is back at Charlie O's this next Friday, September 17, at 8pm. She'll be performing songs from her acclaimed "Shadow of Your Smile" CD. "I'm really overwhelmed amazed and humbled by the incredibly warm welcome I have received performing my music here in Los Angeles, I love the City, I love the People and most of all I love it when we all get together and share our love for the Music. That's my Paradise," says our LA-based Icelandic jazz diva. She's also preparing a new album. "I'm just working like a maniac finishing up my Christmas CD with Vinnie Colaiuta, Olafur Gaukur, who also wrote some amazing arrangements, Don Grusin, the wonderful Dave Carpenter and Charlie Bisharat. The tracks sound amazing! I'm so excited about this one!" We can't wait to listen to it! 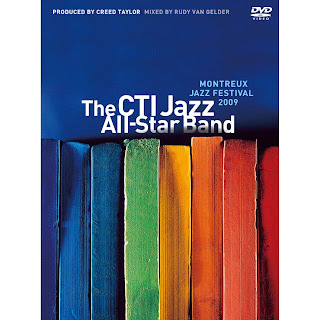 DVD of the Week - "Wes Montgomery: All Stars/Hamburg 1965"
Part 1 - "Wes Montgomery All Stars"
Part 2 - "Wes Montgomery Quartet"
Growing up in Orange County, CA, Teryn has had many opportunities to grow and expand in her musical abilities and interests. She attended the Orange County High School of Performing Arts (OCHSA) as a Piano Performance Major. By her sophomore year she decided to pursue voice and went back to public school in Aliso Viejo, CA for the rest of her high school career. There she began developing her love for jazz, but never knew it would develop into her passion. 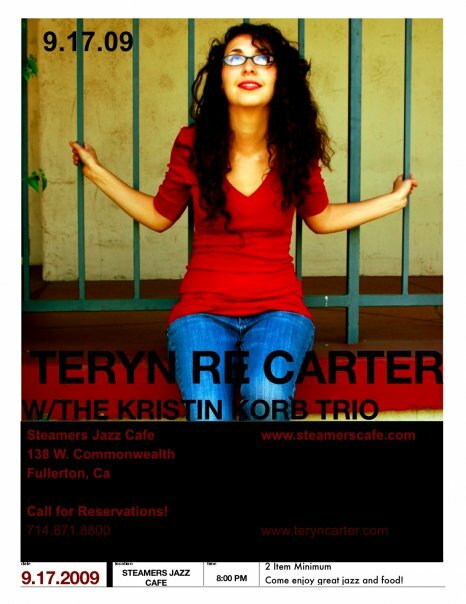 While attending Azusa Pacific University in Azusa, CA, Teryn took jazz vocal lessons from the well-known Kristin Korb and continues to collaborate and work with her as well. Today Teryn continues playing with her combo at various events and venues. 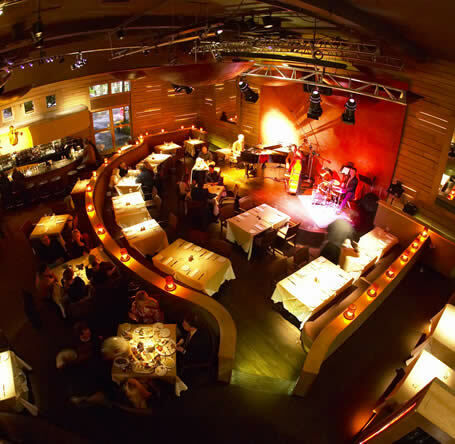 She was recently featured as the jazz artist for the Young Artist Series at the Catalina Bar and Grill and looks forward to developing her musical reputation around the area! Last week the party was shaking...Check it out this week! 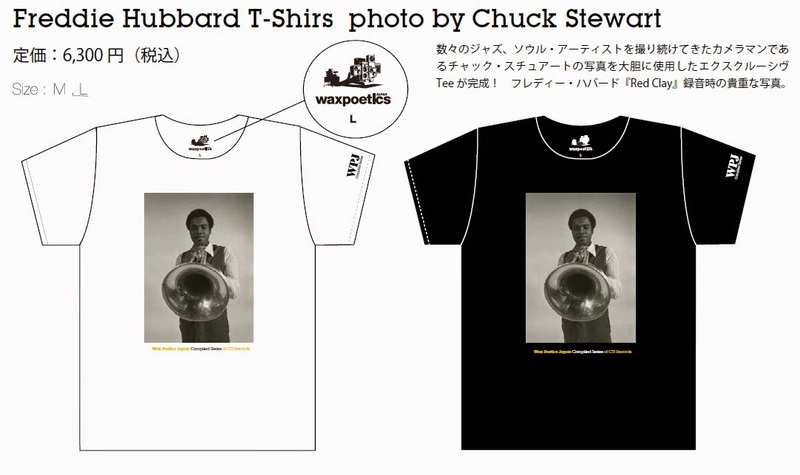 While, in the USA, Sony Masterworks prepares to celebrate the 40th anniversary of CTI Records with a reissue series scheduled to start in October, Creed Taylor himself does the same in Japan! Besides the eagerly awaited release of the CTI All Stars reunion "Montreux Jazz Festival 2009," three compilations selected by the Japanese staff of Wax Poetics (a bi-monthly American magazine focused on all aspects of hip-hop, record collecting, and musical history) will be released next November 3rd. 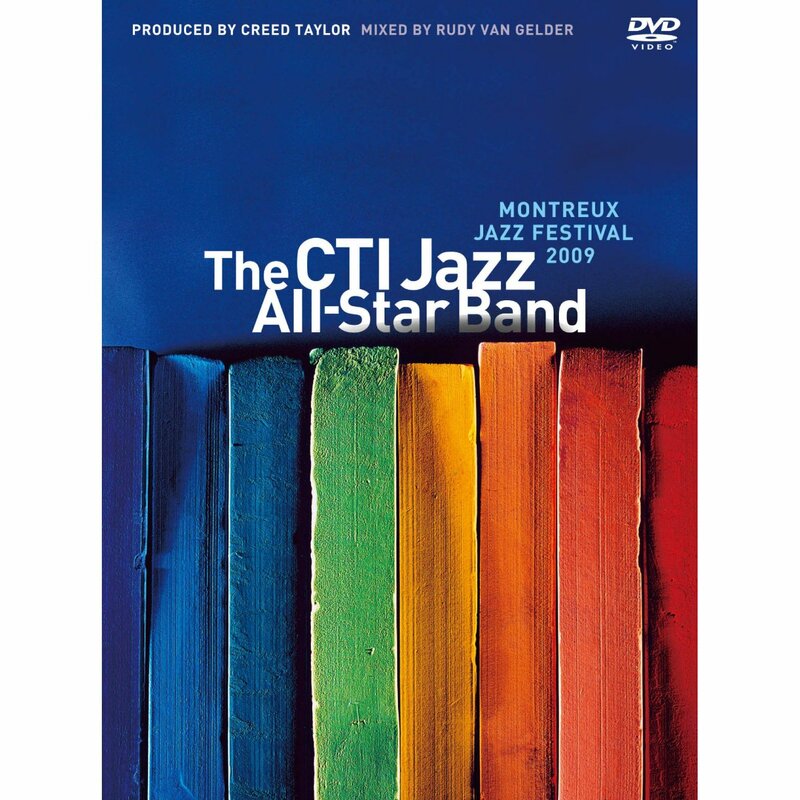 The CTI Jazz All-Star Band concert filmed live in High Definition at the Montreux Jazz Festival on July 7, 2009, will finally hit the stores on November 3, distributed by King Records in nothing less than 3 formats: CD (CTI KICJ 593 with eight tracks and 65 minutes), DVD (KIBM 253) and Blu-ray (KIXM 49), with bonus material in the 82-minute video formats mixed by Rudy Van Gelder in 5.1 Dolby Digital. 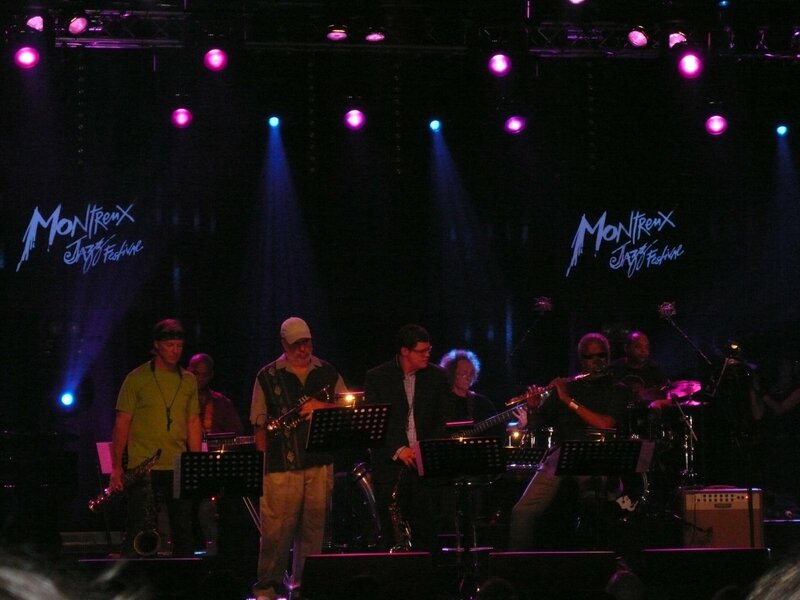 The band line-up includes Hubert Laws, Randy Brecker, Bill Evans, Mark Egan, Jeff Watts, Airto Moreira, Russell Malone, Niels Lan Doky, Todd Bashore and special guests Flora Purim & Jamie Cullum. John McLaughlin & George Duke sat in with the band during the encores, appearing on Benny Golson's "Blues March." 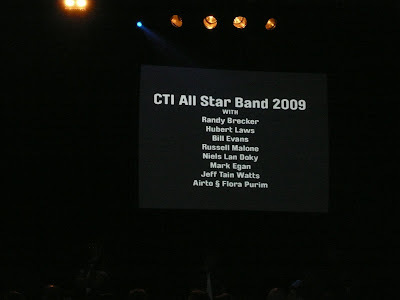 Stanley Turrentine's CTI anthem "Sugar," Weldon Irvine's "Mr. Clean" (made famous on Freddie Hubbard's "Straight Life"), Hubert Laws' "Bimbe Blue", the gospel hymn "Amazing Grace" (also featuring Laws, who recorded it for CTI twice, on "Morning Star" and "The San Francisco Concert"), the Jamie Cullum tribute to Esther Phillips via Bill Withers' "Use Me" (covered by Esther on "Alone Again, Naturally"), Airto's "Misturada" and his legendary vocal/pandeiro solo (here titled "Brasil e África") are among the selected tracks. 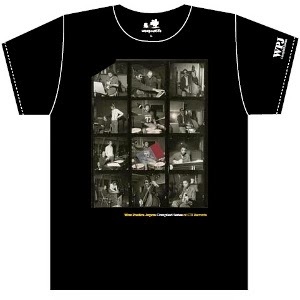 Wes Montgomery's "Road Song," featuring Russell Malone, appears as bonus track on the DVD and Blu-ray issues, both including a 12-page booklet. 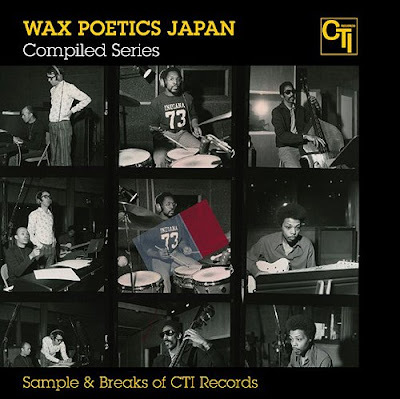 CTI compiled by Wax Poetics! 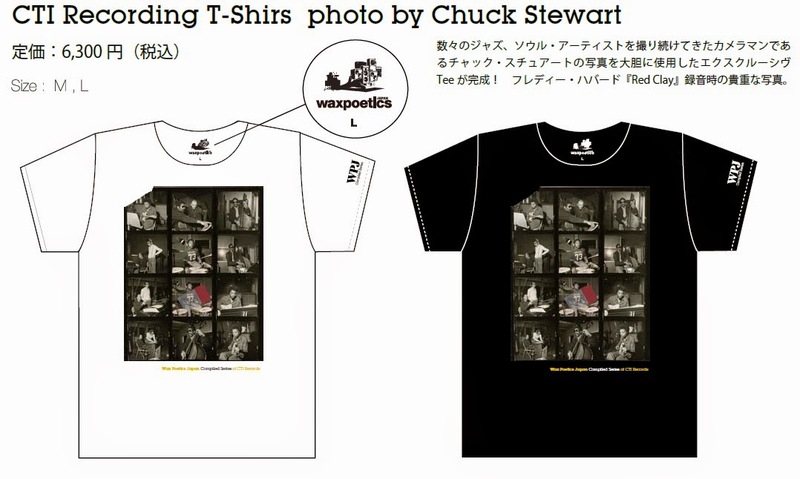 3 CDs,1 Vinyl Single, and T-Shirts by Chuck Stewart! 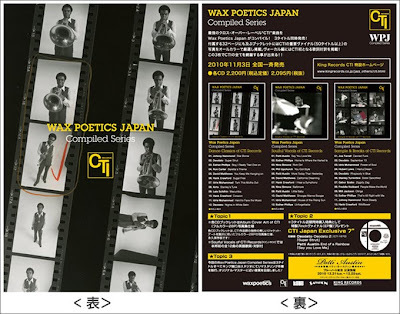 The first three CTI compilations scheduled for November 3rd release were prepared by the guys from the Japanese team of Wax Poetics magazine & website. 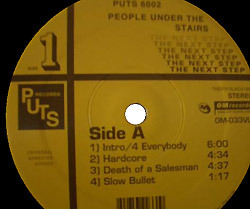 They include tracks not only from the golden era of Creed Taylor's main CTI imprint, but from its subsidiary labels Kudu and Salvation as well. Johnny Hammond's dancefloor classic "Star Borne" (from his Salvation album "Gambler's Life," produced by Larry Mizell) starts the CD "Dance Classics of CTI Records" (CTI KICJ 601), which also includes another frenetic track from the Salvation catalog: "Stanley's Tune," the Stanley Clarke-composed opening tune from Airto's "Virgin Land," produced by Billy Cobham. 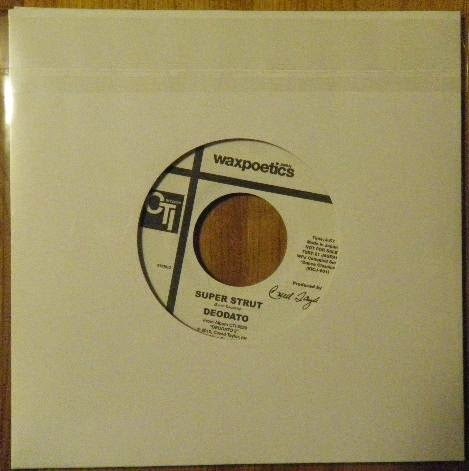 The soul/R&B-oriented grooves from the Kudu vaults are represented by Ron Carter (Dave Grusin's "Baretta's Theme"), Esther Phillips' "Boy, I Really Tied One On" (with Allan Holdsworth on slide guitar), a couple of Hank Crawford's tracks -- "Sugar Free" and Carole King's "Corazon" -- and two groove lessons provided by legendary drummer Idris Muhammad: "Turn This Mutha Out" and "Hard To Face The Music." 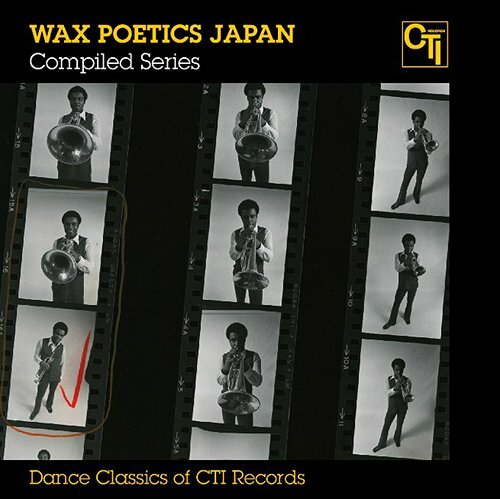 Joe Farrell's massive title track from his (never reissued on CD...) "Canned Funk" album begins "Sample & Breaks Of CTI Records" (CTI KICJ603). It's by far the most interesting track in this compilation, completed by a selection of predictable, although great, choices. The list includes Deodato ("Rhapsody in Blue," "September 13"), Milt Jackson ("Olinga"), Hubert Laws ("I Had A Dream"), Stanley Turrentine ("Sister Sanctified"), Gabor Szabo ("Ziggidy Zag") and the favorites of the Wax Poetics guys: Idris Muhammad ("Power of Soul"), Hank Crawford ("Wildflower"), Johnny Hammond ("Rock Steady") and Esther Phillips ("That's All Right With Me".) The CD front cover brings photos of Bob James, Weldon Irvine, Ron Carter, Billy Cobham and Cornell Dupree (pictured by renowned photographer Chuck Stewart) from the recording sessions, at Van Gelder Studios, of Stanley Turrentine's "Cherry" album, which yielded the track "Sister Sanctified" included in this CD compilation, but already previously available on Arnaldo DeSouteiro's "CTI: Acid Jazz Grooves" CD released back in January 1997. 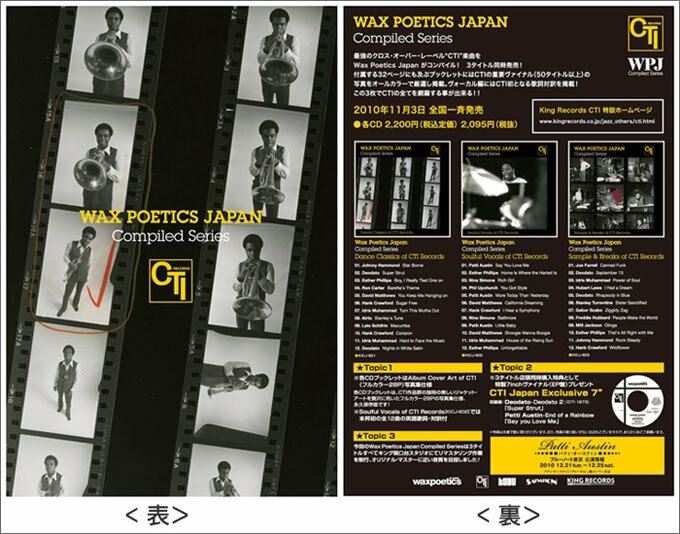 To complete the "packet," a 7" vinyl single - featuring Deodato and Patti Austin - and special CTI T-shirts with pics by the great photographer Chuck Stewart, used in the covers of these Wax Poetics compilations, will also be available for avid CTI collectors. Single of the Day - "Airto: Tombo in 7/4"
CD of the Day - "Juliana Aquino: DiscoBossa"
Sony Holland live @ Charlie O's, tomorrow nite! Melena live @ Steamers, tonite! Book of the Month - "Brazilian Piano"
DVD of the Month - "Jaco Pastorius: Trilogue"